The Trusted Application API is our vision of an extensible Skype for Business Online Cloud that meets your demand for powerful, back-end features. The API aims to provide developer opportunities similar to Skype for Business Server's Unified Communications Managed API (UCMA)...in the cloud. The API enables a cloud-first approach and additional powerful features that aren't available to on-premises Skype for Business Server customers through UCMA. Built on the Skype for Business Online Platform, the Trusted Application API lets a developer build immersive, smart, and interactive communication experiences and trusted services. The Trusted Application API marks an evolution of the on-premises Unified Communications Managed API (UCMA) middle tier platform to a normalized and service-oriented architecture. Fundamentally, the core Platform Service that exposes the Trusted Application API shares the same compute and storage resources across multiple applications, tenants, and domains. It helps reduce operational costs and makes scaling easier as demand grows. At the same time, it guarantees to its service consumers and end users that communication resources and tenant/domain-specific application data are properly isolated to mitigate any security risks that would stem from untrusted tenants and applications. Service-to-service authentication of the Service Application that invokes them. For security and billing reasons, granting an application the permissions to access such APIs is a prerogative of Tenant Administrators rather than end-users. Once a Tenant Admin gives consent to use an Application (which may have implications on usage and billing) they may manage it to the extent of permissions that are usually bound to the domain (or a subset) they administer. The Trusted Application API allows you to write SFB Online applications that act as a service endpoint and do not require a user context or identity. The most common scenarios are applications that schedule or manage on-demand meetings like a contact center type application, that can create on demand meetings to handle customer calls and add customer service representatives to the meeting, voice based call answering and routing bots. The following diagram shows how the Trusted Application API is positioned as a middle tier Software as a Service component in Skype for Business Online. A 3rd party Service App can add value to an enterprise Skype for Business solution by providing a simple RESTful interface between a mobile client and the Trusted Application endpoint. For example, a Service App helper method can handle authentication token fetching and discovery services for a mobile client. It can call Trusted Application APIs to create new meetings and then return meeting join Urls to mobile clients that will join the meetings. 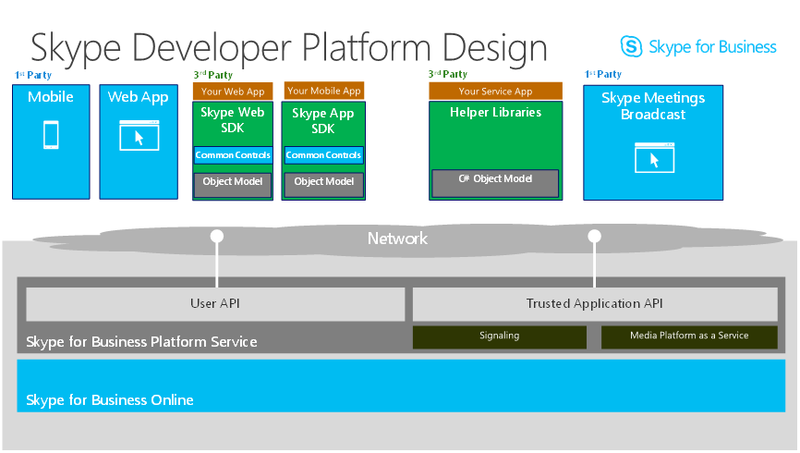 Prior knowledge and understanding of the following APIs from the Skype Developer Platform greatly simplifies understanding of the Trusted Application API. UCMA is a C# API that includes development and runtime components for Skype for Business Server. Like the Trusted Application API, UCMA makes it easy for developers to develop powerful communication solutions. Knowledge of UCMA is helpful for understanding similar communications scenarios in the Trusted Application API: Sophisticated contact center or help desk scenarios, such as those that use interactive voice response (IVR), automated call distribution (ACD), and call-recording. Other scenarios include web chat, query response bots, and conferencing. The Trusted Application API does not provide feature parity with UCMA and does not provide the ability to directly port on-premises UCMA applications to the cloud. Although designed to enable similar business scenarios, unlike UCMA, the Trusted Application API is designed with modern web service development principles and a RESTful, services-based architecture.